This category includes royalty-free symphony, orchestral and classical music, as well as chamber music. Symphony orchestra instruments are featured in full orchestras, chamber orchestras, quartets, etc., as well as solo instruments. You will therefore find brass, string, woodwind and percussion instruments, among others, as well as choirs. Nice cinematic music performed by a complete classical orchestra. Powerful brass section in this arrangement and smooth strings ensemble. 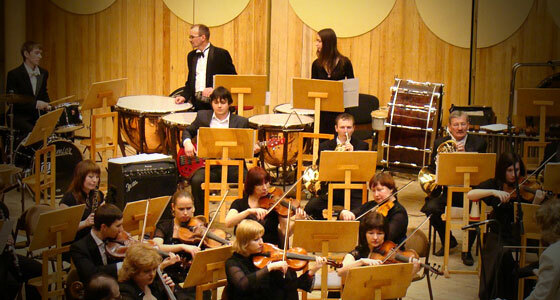 Orchestral music, featuring brass, strings, woodwind and percussion sections. Cinematic music and powerful sound. Nostalgic royalty free music track featuring piano, string section consisting of violas, violins, basses and cellos. Also solo violin, solo viola and solo cello. Some instruments are played pizzicato. Nostalgic short music featuring basses, cellos, violas and violins. Joyful and funny music track. Fast tempo and positive ambiance. This music features double bass and viola playing pizzicato, violins, tuba, solo bass clarinet and orchestral percussions. Nostalgic and sad short royalty free music featuring cellos, violas, basses and violins. Sad and dramatic atmosphere. Symphonic music with glockenspiel, string section, bass, piano playing arpeggios and solo violin. Positive and nostalgic atmosphere, can dress a scene of enchantment, wonder, innocence, childhood, magic, fantastic.. Romantic and nostalgic orchestral music featuring string sections: cellos, violas, bass and violins. Sweet waltz in a slow tempo. Royalty free symphony music featuring string section with cellos, violas and violins, percussion, solo bass, solo violin, celesta. Romantic, epic and positive music. Nostalgic music track in an orchestral style. Music featuring acoustic piano, cello, violin and viola. Royalty-free Orchestral music with celesta, glockenspiel, harp, violin, sections of violas, cellos and basses. Positive atmosphere, suitable for fairy tales, enchantment, wonder, mystery, deception..
Royalty free symphony music. Very nostalgic and contemplative track with cello, bass, piano, violin and viola. Royalty free music in a symphony style. Music featuring strings section, hang drum, piano, celesta and orchestral choir. Royalty free orchestral music with string sections: basses, violins and violas. Dark and mysterious atmosphere can accompany a scene of suspense, fear, drama, misery..
Symphonic Music with string section playing pizzicato, oboe, flute, tuba, violas, violins, timpani and brass. Beethoven style. Positive atmosphere, strength, hope, energy, power, passion ..
Symphonic music: woodwind section, strings, organ, timpani and tuba. Sweet and sad atmosphere, path, reflection, sadness, introspection, happy ending..
Royalty-free classical music with flutes, violin, oboe and bass. Melancholic atmosphere. sadness regret, sorrow, disappointment, resignation..
Symphonic music with organ, vocals, bass, strings and brass section. Religious atmosphere, celeste, mystery, eternity. Orchestral music: cellos, basses, violas and piano. Disappointment, sadness, nostalgia, resignation, hope,..
Royalty free Orchestral music with symphonic orchestra: brass, timpani, strings, oboe, trombone and piano. Tension, suspense, conflict, drama, sadness,..
Symphonic music, with tuba, bassoon, strings section, basses pizzicato and timpani. Nostalgic, romantic, sad, magic, fantasy..
Orchestral music with horns, flute, oboe, bass pizzicato, violas, cellos, drums and violins. Malice, fairy tales, enchantment, childhood, innocence, wonder, strange ruse..
Orchestral music with flutes, bass, cellos, violins and violas. Playful mood, joy, childhood, cunning humor..
Royalty-free symphonic Music with string sections and oboe. Dark and gloomy atmosphere, despair, tragedy, misfortune,.. Medieval music with oboe, bassoon, guitar, percussion and tuba. Sweet and positive atmosphere, journey, hope, open spaces.. Medieval music with choirs, oboe, bassoon, guitar, percussion and tuba. Positive atmosphere, hope, power, hope, glory,..
Royalty free classical music with strings, timpani and brass. War atmosphere, suspense, mystery, drama. Orchestral music with brass flutes, bassoon, oboe, bass, cellos, violas and tuba. Disappointment, melancholy, sadness, nostalgia, resignation, war, hope,..
Symphonic music with brass woodwinds and strings. Tension, suspense, war,..
A particular composition with strings, woodwinds and trumpets. Mysterious atmosphere, melancholic, sad, fantastic..
Royalty-free orchestral music with strings, woodwinds and brass. Soft environment, peace, air,..
Symphonic music: strings, oboe, flute, drums, synthesizer and tuba. Positive mood, style, power, glory, hope, open spaces..
Symphonic composition with strings, woodwinds. Beethoven style. Very fast... Atmosphere power, strength, fame, pursuit,..
Orchestral composition with Voice, string section, timpani and brass. Religious environment, war, nostalgia, sadness, suspense, mystery, drama. Royalty free classical music with flutes, oboe, bass, cellos, violas, violins and tuba. Disappointment, melancholy, sadness, nostalgia, resignation, war, hope,..
Orchestral music with string section. Flanger effect is applied to the music. Tension, suspense, war,..
Symphonic music with strings, xylophone, woodwinds, glockenspiel and percussion instruments. Childhood, innocence, wonder, magic..
Orchestral music with strings, woodwinds and brass. Soft mood, sadness, nostalgia, dream..